Ground Collapse is one of those cards that if you want to play, you would need 3 in your deck. Getting one out against your opponent is usually pointless, but 2 would be amazing. That's less Flip effects and less offense from your opponent. However, the problem with playing 3 is that you waste 3 spaces which might be more useful if you put some other cards instead. Remember, you should always play a deck with 40 cards (or close to it), otherwise you lower your chances of getting that one card that you really wanted at a particular time. Overall, it's a pretty good card. This card lets you choose 2 open monster spots on the field. No monsters may be played in the selected zones. with some magic and trap negation, you can usually mop up the duel real quick. However, situations where you actually get 2 or 3 Ground Collapses on the field, along with the proper protection cards are rare. They'll usually be destroyed before you can do too much damage. I give it 3/5. Unless you're playing some sort of a lockdown deck, I don't recommend that you use it. This card is annoying for two reasons. One reason is the fact that it limits the number of monster cards you can have on the field. The other reason is that it seems to be quite popular. I honestly will probably never use this card, but I may give it sidedeck consideration, as it counters Scapegoat quite nicely. (To the best of my knowledge, you are required to have at least 4 open Monster slots to use it. With Ground Collapse blocking off two spots, making your maximum useable 3, Scapegoat would be an illegal play.) 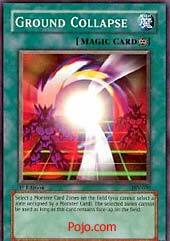 This also cripples what is sure to be one of the most abused cards in the game, United We Stand (j. Power of Teamwork). Getting two of these out can cause major frustration for your opponent, as they will only have ONE available slot (remember that monsters on the field already aren't affected, so don't think this is some kind of a Raigeki-like thing). Three is impossible to play, as Ground Collapse must block off 2 slots, and there's only one slot left to block off. Other than shutting down Scapegoat, this card has no real uses if you only have 1 on the field, because not many people will consistently have 3+ monsters on the field. Two of these is a pain, though. Unfortunately, there's a lot of ways to counter this guy. Any M/T removal works (mass removal like Heavy Storm screws you over), and Imperial Order makes those slots reusable during its duration. If you're playing a stall deck, this may be the card for you. Just be warned that it may not always help you.